DREAM Electronique manufactures a choice of four different diameters for anodes : 600mm, 350mm , 250mm and 180mm . The anode of 600mm diameter will be chosen for a longer range or for fresh water of low conductivity. In addition, a large diameter decreases the area of tetany, located near the anode. So, Electro-fishing is more painless for species with a large diameter anode . However, with high water flow handling becomes difficult. 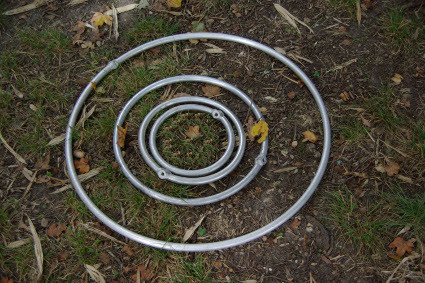 The anode of 350mm diameter, is the standard anode that DREAM Electronique provides in all configurations of electrofishing. The anodes of 250mm and 180mm diameters allow a field of more intense but shorter attraction. The tetany area increases at the expense of the directionnal forced swimming area (electrotaxis area). These anodes can also be useful for fishing in freshwater of high conductivity (lower resistance between the electrodes). Even though electro-fishing is around the anode, the importance of cathode should be not underestimated. Indeed electro-fishing efficiency decreases when the surface of the cathode is insufficient. To avoid all these problems, a suitable cathode surface must be used. The surface of the fixed station cathode we offer, used with a HERON® or an AIGRETTE®, provides an effective electro-fishing, matched with a standard single anode of 350mm diameter. For electro-fishing with several anodes or with a 600 mm diameter anode, we recommend to add one or two additional cathodes. The cathode surface in a boat. The dimensions of the standard cathode does not allow its use on small boats. DREAM Electronique has developed more compact cathodes for boat. The length of the cathode is reduced so that it does not touch the propeller. However, in order to keep the performance of a standard cathode , it is necessary to use at least two cathodes. 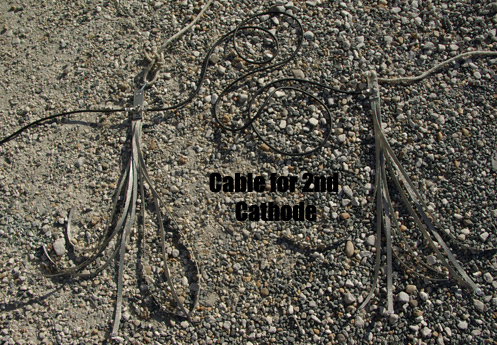 The cathodes are connected in parallel using " cable for second cathode ." The cathodes for boat manufactured by DREAM Electronique consist of 8 braids, you can choose the length between 0.5 and 1 m depending on the size of the boat. The electrical connection by 8mm ring terminal, allow to connect two terminals, one to connect the cathode to the main unit HERON® or AIGRETTE®, the other to connect a second cathode. The mechanical connection secures the cathodes on the boat in order to avoid tension on the electrical wires. The connection is made with maximum 10 mm diameter rope, or directly with a snap hook of 60mm minimum size.